Body Science BSc are considered one of Australia’s premier supplement and sporting brands and are best known for their range of fat loss support supplements, protein powders and compression gear. Having recently changed the look of their entire range, BSc have already released a brand new weight loss product based on green tea known as Body Science BSc Green Tea TX100. The TX100 comes in 60 single serve sachets of 3g and has only 7 calories per serve with no added sugar. It is suggested that you take 2 sachets a day. Green tea is considered by many to be a miracle drink. It seems to be able to support general health and wellbeing, support improved mental processes such as cognition, mood, focus and anxiety as well as potentially improve longevity and may even be a preventative agent against certain cancers. One of the biggest and most common uses for green tea and green tea supplements is to act as a fat loss and weight loss support ingredient. Its main mechanism is to act as both a carbohydrate absorption inhibitor as well as a fat metabolisng agent. In other words, green tea can help to prevent carbohydrates from being absorbed and therefore being stored as fat and can also increase fat burning to some extent. These effects are due to certain active compounds known as catechins in the tea. The level of green tea used in the TX100 will most certainly provide the required 500mg to 800mg of catechins required to benefit those after fat and weight loss. The added probiotic lactobacillus and vitamin C should prove beneficial for many in terms of digestive and immune health. Addition of vitamin C was also a great idea as it has been shown to enhance catechin bioavailability. There are very few negatives for the new supplement from Body Science. It provides a good hit of the active component of green tea which helps to support beneficial health effects and fat loss. It’s a little pricey, but it does save you having to drink about 8-10 cups of green tea every day. Rather than adding lactobacillus, it would’ve been better if BSc added in other beneficial polyphenols or other compounds such as fish oil, curcumin, quercetin and caffeine, which all have synergistic effects with each other. In other words, the combination of catechins with the aforementioned ingredients makes them work better. 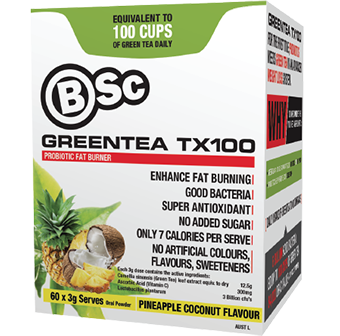 BSc Green Tea TX100 currently comes in one flavour; Super Berry. The supplement tastes very similar to a dilute berry cordial and is easy to mix and easier to drink. Made with cold water, you can easily drink it all day as a source of hydration. Body Science’s new Green Tea TX100 is a tasty and low stim way to support fat loss and weight loss. It’s easy to drink and provides a good hit of catechins which can block carb and fat absorption as well as boost overall metabolism. At under $2 a day, it’s an inexpensive way to keep your fat mass in check and hydrated at the same time, so what do you have to lose?